"The end is nigh..." is a term that is popular for describing a situation of looming doom. 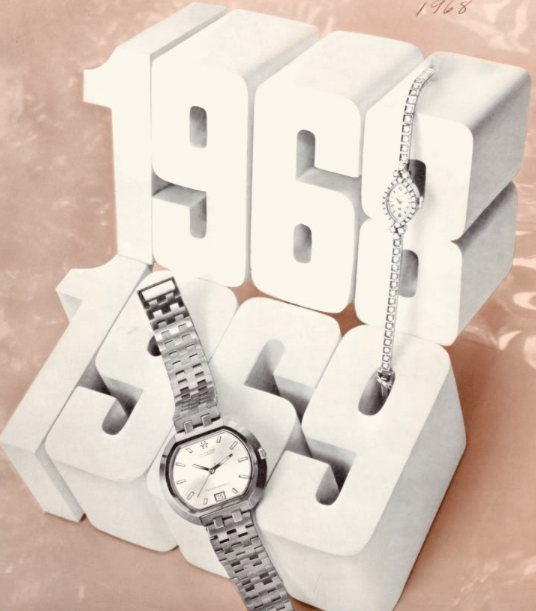 I wonder if the graphic artists behind the 1968 / 69 model catalog had a sense of what the future held and that US production would be discontinued in the near future? 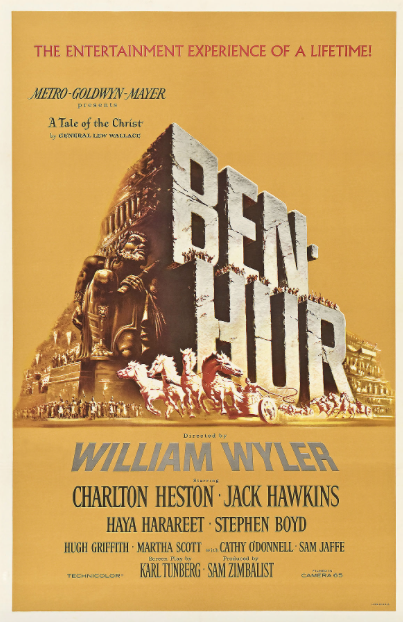 The graphic chosen does seem to present an image of biblical proportion - almost like it was inspired by Ben Hur... but I doubt it. Hamilton continued to introduce new models so I doubt the environment was completely desperate. In fact, by the end of the 1960's Hamilton had other interests beyond just watches. The Hamilton Watch Company owned other divisions like Military Products, Precision Metals, and an Instruments Division, among other things. 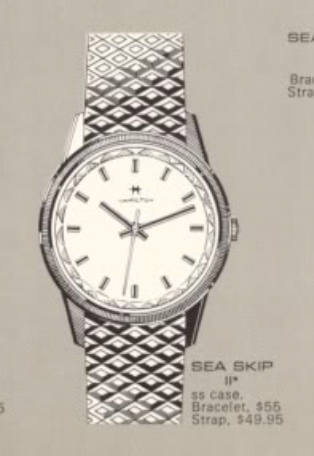 One of the models introduced in 1968 was the Sea Skip II. It was produced through 1971. The Sea Skip II was one of the many Sea-somethings and it's an interesting looking stainless steel model with a "diamond-edge" faceted acrylic crystal. You could get it on a matching bracelet or on a strap. I recently came upon a Sea Skip II for sale and when it arrived I was almost sure it was close to new old stock. It was in great shape and the bracelet it came with seemed to be an excellent choice. Of course, upon close examination I realized it was a Speidel bracelet and that meant it was quite likely not the original bracelet. Comparing it to the catalog removed all doubt, but the bracelet was still a very complementary design nonetheless. Like most Sea-somethings, the Sea Skip II opens through the crystal and once the crystal is lifted out of the way, the movement can be carefully pivoted out of the case and separated from the crown. Looking inside the case there are no service marks inside. The lower of the two numbers is the model number and the last two digits (68) indicate this model was introduced in 1968. The number above is a unique serial number for this case. Inside the case is a 17 jewel Hamilton 688 movement. This movement is very similar to the ETA-based automatic movements used in the 1960's but it's a manual movement and missing the automatic framework takes onto the back. The freshly cleaned movement is sparkly clean and ticking away with good motion. Off to the timer to see how well it's performing. Well... something is going on inside. Could be a piece of lint or dust in the wrong place. It took some tweaking and recleaning but eventually the signature on the timer looks great. With all of the other parts reinstalled, the finished watch looks even better than when it arrived. The black and white hands and hour markers change colors with how the light reflects. From this angle the hands look black. From the side the hands show off their chrome and black design. The faceted crystal adds and extra bit of bling to an already blingy watch. Hello Dan. I was just wondering. Do you wear a vintage Hamilton watch as your daily watch? I have worn one at work in a warehouse. A Barry and a Neilsen. My "work" watches is a rotation of LL Bean Hamilton quartz, Timex quartz and Seiko Solar. I have noticed that the smaller size of the vintage watches are an advantage as they do not seem to hit or get snagged on things. So they have held up well. Some of the modern blingy watches are so huge I would imagine they bang on everything. I have a lot of watches to choose from, including an Apple Watch, but I usually wear one of my vintage models. I also have a number of modern Hamiltons and they get a fair amount of wrist time as well. I suppose the Pareto Principle would apply and 20% of my watches get worn 80% of the time.